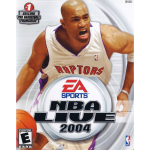 Bring a beloved classic up to date with today’s file addition for NBA Live 2004 PC! Murat has put together an art pack for the 2018 season, which you can download at the link below. If you follow the links in the description for the art pack, you can find some other updates for NBA Live 2004, including a 2018 season roster.